Everything is cute when it’s tiny. Everything. Think about it. Babies, Snickers Bars, even sloths are cute when they’re babies and those are not cute animals. And trucks are cute when they’re tiny. Just ask your Chevy truck dealer about the Chevy LUV, a truck in miniature, and you’ll see what I mean. During the 1960s, while America’s Big Three automotive manufacturers, Ford, Chrysler, and GM, were focused on the muscle car’s pony war, Japanese auto makers were busy tweaking the compact pickup truck. Our American spirit spurred to action by competition (we’re just not happy if we’re not number one), Chevy released the little Chevy LUV. The LUV was still a Japanese vehicle though, simply rebadged and imported from Isuzu, which was able to produces these trucks at minimal costs compared to the U.S. Besides, during the sixties and seventies, General Motors was the biggest corporation in the world, and thus, reigned supreme over the American automotive industry. Basically, it could do whatever it wanted. But, the competition stiffened thanks to the reliable and affordable vehicles released by Honda, Toyota, and Nissan/Datsun. I’m partial to Datsuns, of course. It was really about the numbers. For example, in 1970, you could purchase a new Datsun pickup truck for just under two thousand dollars, compared to the roughly $2,700 Chevy C10 from the same model year. This made it extremely attractive to the younger generation of car buyers because they could actually afford the perfectly capable Datsun truck. It was clear that Chevy had to do something in order to stay in the game. As part owner of Isuzu, Chevy outsourced their compact truck to Japan, imported the finished products and then rebadged them as a light utility vehicle, or LUV. Ford quickly followed suit. Copy cats. What’s important to remember about the Chevy LUV and the compact pickup truck segment in general, is that it was created out of necessity, with practicality emphasized over performance. In 1970, the United States was grappling with a major oil crisis and the LUV was manufactured for fuel efficiency, which it had in spades, consistently topping thirty miles per gallon. Given that automotive technology wasn’t remotely close to where it is now, the LUV had to sacrifice power for that kind of fuel economy. Sacrifice it did, and it’s easy to see how, as the U.S. recovered from the oil crisis, the Chevy LUV started fading from view. Constructed on a 102.4-inch wheelbase, poised on a ladder frame, the 1972 Chevy LUV featured a suspension with unequal a-arms in front and a leaf-spring rear axle in the back. The wheels were a slim 14-inches wrapped in bias-play tires. The Chevy LUV tried to look like its big brother, sporting the same quad headlights and taillights beneath the tailgate, but it’s small stature really set it apart from the larger Chevy trucks on the market. Equipped with a 1.8-liter four-cylinder engine operated with a four-speed manual transmission, this powertrain could generate 75 horsepower at 5,000 rpm with 88 lb.-ft. of torque at 3,000 rpm. Even though it was only in its first year, Chevy sold 21,098 units of the LUV pickup truck. Not much changed the following year, other than the headlights with squared off bezels. Sales jumped to 39,422 trucks, or trucklers, as they are sometimes called, sold during that year. Things were heating up for the LUV, but Chevy was reserved with respect to upgrades and enhancements. For the 1974 model year, the Chevy LUV was only slightly altered to show off re-positioned and redesigned headlights. An additional trim level, called the Mikado, was made available and provided an enhanced interior, covered in striped upholstery with a fancier exterior and a three-spoke steering wheel. Sales slipped a bit, but the LUV was getting attention. The 1975 model year came and went without changes of any kind. 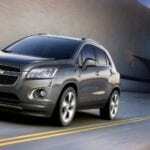 But for the following year, Chevy released an optional three-speed automatic transmission for the first time, as well as front disc brakes. Those additions boosted sales to 46, 670 units, but that was nothing compared to what was coming. By the time 1977 rolled around, the Chevy LUV came available as a bedless chassis cab, with a enhanced engine, able to get 80 horsepower. Overall sales for 1977 edged up to 67,539 trucklets. The first major design change arrived in 1978, with the number of headlights reduced by half, leaving two where there used to be four. An additional grille and two bed options were also offered, with the standard 6-foot bed and 102.4-inch wheelbase remaining the same. But, the other, the available seven and a half foot bed was built on a new chassis, which had a larger wheelbase of 117.9-inches. Adding a brand new instrument panel sent sales upwards of 71,000 units. Just barely missing Motor Trend’s “Truck of the Year” award for 1979, the Chevy LUV, now available with four-wheel drive, came in second place. Although it was a very capable and popular trucklet, the 1979 Chevy LUV was very slow. Takin 17.4 seconds to reach sixty miles per hour, and rounding off the quarter mile in 20.7 seconds at 64.3 miles per hour, consumers weren’t impressed with the LUV’s performance. Even though sales spiked to more than 100,000 LUVs sold, the numbers soon started to plummet. The 1980 Chevy LUVs sold less than 90,000, and reviews were highlighting some of the LUVs lesser qualities. One generation in and the LUV was tanking and tanking fast. Although Chevy did release a second generation of the LUV in 1981, it received a less than enthusiastic response. Nothing much in the looks department, it was hard to spot significant changes on th e1981 Chevy LUV because there really weren’t any. Despite that, the LUV was released again in 1982, but again without major changes. Officially discontinued by Chevy in 1983, Isuzu continued to manufacture the compact truck, but did not call it a LUV. The Chevy S-10 ultimately replaced it, with the major difference being that this was a Chevy truck actually made on home ground. Although the story of the Chevy LUV is a short one, it’s miniature run was important to the evolution of the compact truck segment and the Chevy brand overall. These were capable little trucks and can still be found on used car lots at your local Chevy dealer. Feel the LUV by resurrecting this tiny treasure, fleets of which are still zipping along the roads abroad on a regular basis. In fact, both the LUV and Chevy S-10 are still manufactured in Latin America and have proven crucial the to the health of that continent’s economy. Last year, rumors swirled about a possible re-release of the Chevy LUV state-side, but we’re still waiting. If Chevy does explore a possible reincarnation of the LUV, industry experts expect it will look a great deal like the Chevrolet Montana LUV, currently manufactured in Brazil.